Western Blot: NOL1 Antibody [NBP1-92192] - Analysis in human cell line NTERA-2. 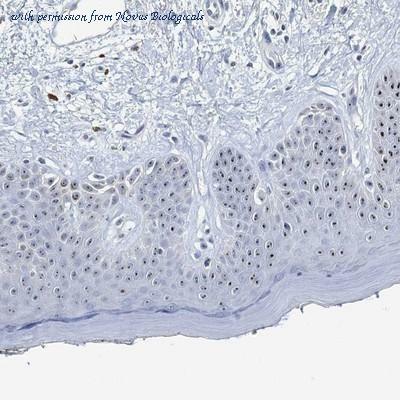 Immunohistochemistry-Paraffin: NOL1 Antibody [NBP1-92192] - Staining of human skin shows distinct nucleolar positivity in keratinocytes. 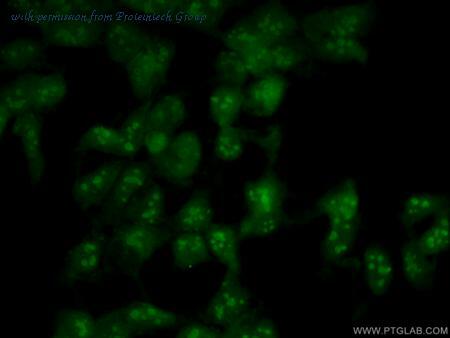 Immunocytochemistry/Immunofluorescence: NOL1 Antibody [NBP1-92192] - The NOL1 antibody was tested in A431 cells at 2ug/ml against Dylight 488 (Green). 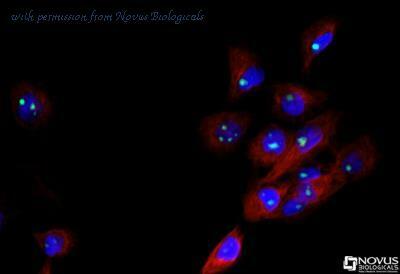 Alpha-tubulin and nuclei were counterstained against Dylight 550 (red) and DAPI (blue), respectively. The NOP2 antibody from Proteintech is a rabbit polyclonal antibody to a recombinant protein of human NOP2. This antibody recognizes human, rat,mouse antigen. The NOP2 antibody has been validated for the following applications: ELISA, IF, IHC, WB analysis.